One of my favorite long-term food choices in our pantry is honey. Storing honey is a popular choice amongst preppers. After all, its versatility coupled with the capacity to last a lifetime is a perfect investment for your long-term food stores. Many are aware of the additives put into honey and ultra-filtering that inevitably removes all of the health benefits it possesses in its natural state. In fact, recent laboratory tests have revealed that 76% of the honey purchased in common chain grocery stores has been ultra filtered. Buying locally will ensure you get the purest form of honey around. As well, purchasing in bulk quantities will help you add to your natural prepper pantries and save a buck at the same time. When raw honey is left in its natural state and is unfiltered, it contains pollen, enzymes, antioxidants and many other beneficial compounds that researchers are just beginning to learn about. Has anti-bacterial, anti-viral, and anti-fungal properties. Due to its low water content, it’s a poor environment for the growth of harmful bacteria. Acts a cough suppressant and soothes a sore or scratchy throat. Boosts immunity, and protects against infections in wounds. May improve blood sugar control and insulin sensitivity. Contains phytonutrients, which have been shown to possess cancer-preventing and anti-tumor properties. Honey from certain flower sources contain friendly bacteria that are good for digestion. Minor source of vitamins B2 and B6, copper, iron, manganese. A few years ago, I was lucky to find a local honey supplier in my area that sells us 20 pound buckets of honey. For a family of five, (see food calculator here) this is enough honey for a year for my family. We usually end up purchasing one to use for the year and another for long-term storage. I have found that scouting out local farmers markets can put you in direct contact with local beekeepers who are more than willing to sell you honey on a regular basis. As well, they have other great products they can sell you like bee pollen, beeswax, royal jelly, and even a beehive, if you are interested. Additionally, farmers markets are great for finding local produce, meat and other food sources. I have also found beekeepers selling honey through Craigslist. What are the kinds of flowers the bees have been foraging on? Knowing the kind of flowers that the bees used for nectar and pollen will give you a good indication of how robust the flavor of the honey will be. Do they mix the honey with any additives? Purity of honey is another issue the USDA does not look into when giving out their sacred “USDA organic labels.” Most store-bought honey isn’t even honey at all. It’s a combination of additives like sweeteners and high-fructose corn syrup (check your maple syrup too, folks!) to make it more honey-like. An advantage to buying from local honey sellers is that they sell a far superior product compared to the honey you purchase in stores. Not only is local honey in more of a pure state, but you have more of a variety that is unavailable in supermarkets. There are tests that you can do to test your honey. Learn about honey purity laws here. Has the honey been filtered to remove pollen? Many honey companies filter their honey to remove any minute particles, pollen and bits of honeycomb. Unfortunately, when companies ultra-filter their honey, they force the proteins out of honey removing the natural health properties in the process. The result is a clearer honey that companies market as healthy, when in reality, ultra-filtered honey does not have many health benefits at all. Most local suppliers skip this step and keep the honey pure. Is it organic honey? I added this because I wanted to inform you all that it is very difficult to find real 100% organic honey. In fact, it’s near to impossible! Honeybees fly an average of 2 miles from their hives in their search for nectar and pollen. A hive would have to be in the center of a minimum of 16 square miles of organic plants. This is extremely difficult to do considering there are neighbors, golf clubs, businesses, etc. who still believe in chemically treating lawns and gardens with pesticides. Wild plants sound good but there could be an issue there if the hives are near any land where herbicides are used, including BLM land. So, here’s the fact on organic honey: There are no standards for USDA certified organic honey. They simply do not exist. According to the USDA Rules and Regulations, “…honey does not require official inspection in order to carry official USDA grade marks and since there are no existing programs that require the official inspection and certification of honey,…” So the organic honey you are purchasing at the store is only a ploy to inflate the price and make more money. Buying locally is your best bet in taking steps to buy the purest form of honey and create a natural prepper pantry. 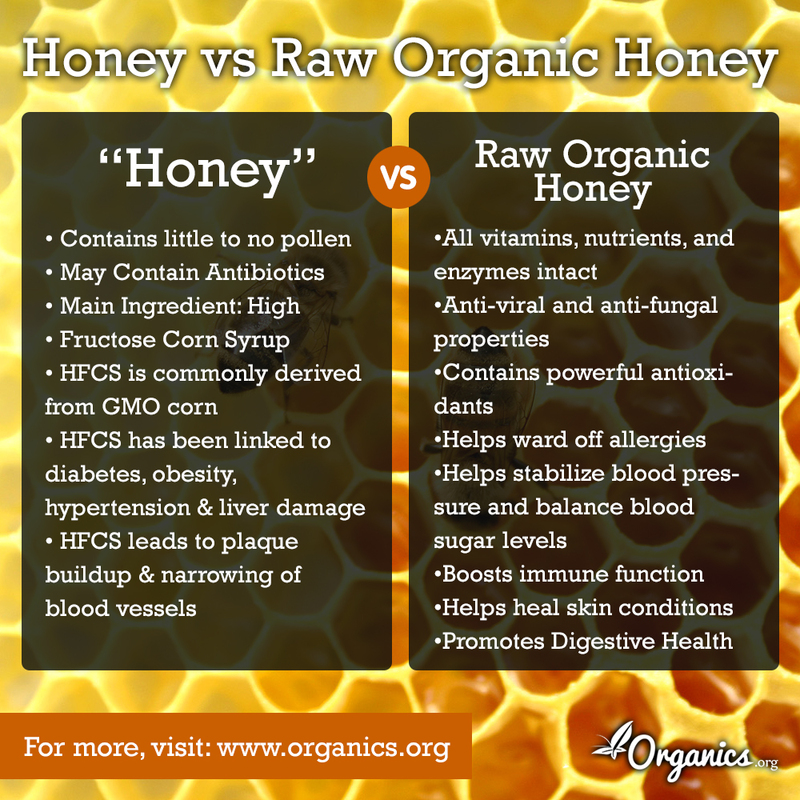 If you decided to purchase honey at the grocery store, make sure you purchase raw unfiltered honey. I have been purchasing local honey for years and have only had one container crystallize; and that was a year after I purchased it. Use these tips when looking for local honey sources.